Animal representations in the sculptural arts of the ancient Near East are remarkable for their evocative expressive power. Beautiful and durable, these artworks have withstood the millennia and preserve the record of humanity, its concerns and beliefs, for all subsequent generations. 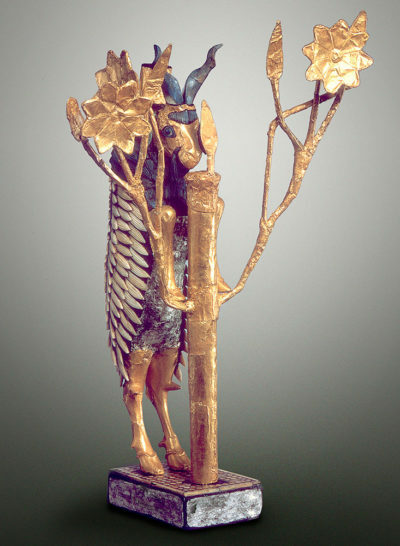 Often combining great attention to naturalistic detail with elements of stylization, the ancient sculptures—made in both stone and metal, some even with silver and inlays of shell and lapis lazuli—have a strong visual appeal; yet they also lend insight on the sacred, profane, sacrificial, and practical realities of the early Sumerian agrarian society, which is popularly known as the cradle of Western civilization. This exhibition presents Mesopotamian sculptural works from ca. 3300–2250 B.C., bringing together for the first time pieces from the Metropolitan Museum of Art, the Yale University Babylonian Collection, the Kimbell Art Museum, and the University of Pennsylvania Museum of Archaeology and Anthropology. Cylinder seals relating to each of the sculptures are also presented, including a remarkable seal from the Morgan’s collection showing animals acting as human. Through a focused consideration of these Near Eastern artworks, the rare objects emphasize the importance of the elements of the natural world that the ancients experienced and, by extension, the interdependence of the natural and the spiritual world. Inspiring the exhibition, the Morgan’s famous 1646 B.C. clay tablet will also be on view; it is inscribed with the “The Deluge Story”—an early version of the familiar tale of Noah. Sidney Babcock is the Jeannette and Jonathan Rosen Curator and Department Head in the Dept. of Ancient Near Eastern Seals and Tablets at The Morgan Library & Museum in Manhattan.